Also known as Imbolg, Candlemas, Feast of Torches, Oimelc, Lupercalia and Brigid's Day. Imbolc is the time of the beginning of beginnings, the time to consider carefully what you will do with the year stretching before you. 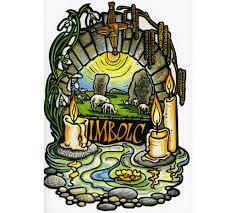 Imbolc brings the awakening of the life force when the first green shoots of bulbs appear. Life is stirring again and this marks the Goddess recovering after giving birth while the newborn God is depicted as a small child nursing from his mother. The God is growing, spreading sunshine all around causing things to grow. It is a time to honour the feminine and get ready for spring. At lmbolc, the Australian forests are bright with the colour yellow, the Acacia trees coming into full flower. Until fairly recently, the 1st of August was "Wattle day" in Australia (it has now been moved to the 1st of September).